Only 4 and a half inches long with a very small bowl, this unique pipe was in vogue in England in the late 16th and early 17th centuries. 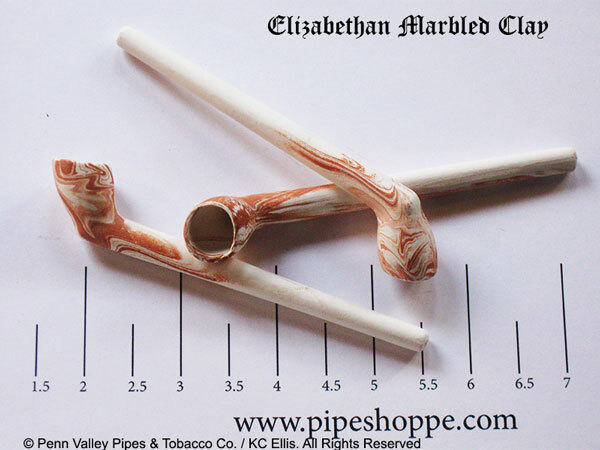 The pipes shown are examples of marbled Elizabethan clay pipe. Each pipe is different so the pipe you get will not match the pipes in the photos. The pipes are sold individually. Only 4 and a half inches long with a very small bowl, this unique pipe was in vogue in England in the late 16th and early 17th centuries. The marbled design comes from mixing white and red clays. 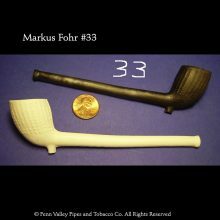 Each pipe is unique, we cannot guarantee the pipe you get will match the pipes in the photo, but yours will be a beauty, no doubt.